If you make bath and body products at home, you have likely struggled to mix coconut oil–which typically comes in a semi-solid, spreadable form–with other ingredients, mixing and blending for precious minutes that you would rather be doing something else. Did you know that fractionated coconut oil, which has been treated to remain in liquid form at room temperature–is a safe alternative to use in your homemade beauty products? Gone are the days of endlessly churning away at the lumpy materials in your mixing bowl–with this liquified coconut oil, you can whip up your favorite homemade bath and beauty products in mere seconds. Fractionated coconut oil from Pure Body Naturals is an example of liquified coconut oil that you can mix with essential oils, Dead Sea salts, Epsom salts or other ingredients to make your own lotions, scrubs, bath soaks and more. It is incredible versatile, odorless, natural and soothing to hair, nails and skin. Although this product is also hypoallergenic, as with any cosmetic ingredient you have not used before, please do a patch test to see if you react to the oil before applying it to your face for the first time. I am allergic to almost anything and everything you can think of, and yet I did not have any reactions to this oil, even when I soaked in a bath using several tablespoons of it. I also used this product as a slick-on skin moisturizer and as a conditioner for my hair; each experiment was successful. This fractionated coconut oil is excellent as a skin treatment–it is non-greasy and absorbs quickly, so you can, for example, read the newspaper (or a Kindle) within a few seconds of rubbing the oil into your hands. 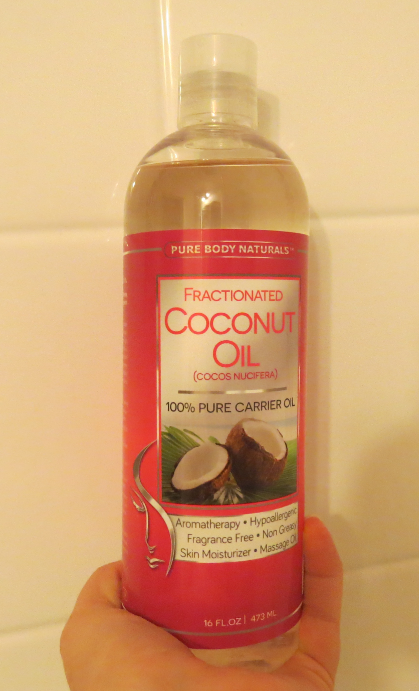 This bottle of fractionated coconut oil from Pure Body Naturals is a whopping 16 ounces in size, so you can concoct all sorts of bath and body product formulas at an economical cost. Few other bath and body product ingredients are as versatile, or as soothing. I am definitely a convert, so from here forward, I will use fractionated coconut oil rather than exhausting myself mixing ingredients with semi-solid coconut oil. On a final note, I received a free bottle of this product in exchange for an honest review.